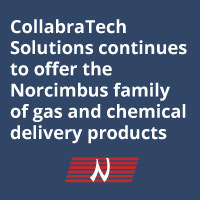 At CollabraTech, we offer a complete line of proven gas and chemical distribution systems and configurable system components for high-purity, inert and reactive materials. Our solutions have been developed and evolved over many decades, and include cabinets and valve manifold boxes, bulk chemical and reclaim systems, liquid and solid precursor vapor delivery systems, highly accurate point-of-use blending systems and PLC-based control systems. In addition, we offer configurable, customized and legacy designs from controllers, panels and skids to complete facility solutions.